Veterinarians across the country are seeing a steadily increasing number of cases of allergies in dogs of all breeds. Rescue shelters are experiencing an unprecedented number of animal surrenders of dogs with severe skin and coat conditions attributed to allergies. The causes of these dramatic increases in canine allergies are not yet clear, but gathered evidence is pointing in several directions. HardyPet is on the front lines with veterinarians and other pet professionals working to determine the source of these allergies and how to provide quick and lasting relief. The IEP (Identify/Eliminate/Prevent) approach to canine allergies was developed by veterinarians and rescue shelters to provide the fastest method to dealing with canine allergies. For dog owners, and especially in the rescue shelter environment, time is of the essence in addressing a dog's skin and coat problems. IEP is a logical approach to troubleshooting the root cause of an allergy instead of just treating the symptoms. IDENTIFY - There are so many compounds which are known to cause canine allergies it can be difficult to identify which one is causing your dog's itchiness. The easiest method is to eliminate every likely allergen in their diet and environment and then slowly introduce new items to identify which substances they are allergic to. 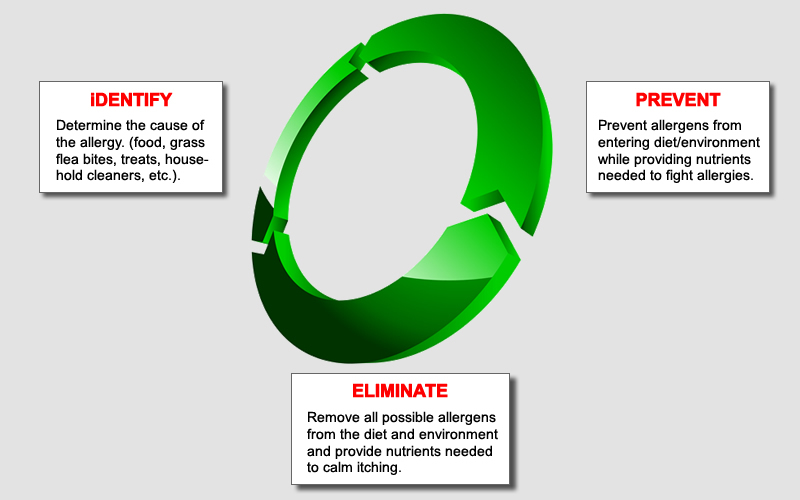 ELIMINATE - Typically allergen identification involves ensuring use of a grain-free dog food, eliminating all table scraps and treats, and restricting the use of household cleaners and harsh detergents for dog bedding and blankets. This can also involve the use of medications to control fleas and other parasites. A key part of this process is the use of nutrients which are known to reduce inflammation and histamine production. HardyPet Skin/Coat is the preferred choice of veterinarians and rescue shelters for this purpose. PREVENT - Once allergens have been removed from a dog's diet and environment, and their scratching and skin irritation has subsided, it is important to prevent reoccurrence. Just one bite or short exposure to an allergen can cause weeks of inflammation and itchiness. The nutrients contained in HardyPet Skin/Coat not only ease the symptoms of an allergy outbreak, they also help to strengthen your dog's immune system which reduces the likelihood of them coming back. · Impaired Immune Function - parasites and certain mites which are normally present on a dog's skin can wreak havoc when their immune system can no longer successfully fight them off. This can result in "hot spots" and overall hair loss. HardyPet Skin/Coat helps to boost immune function with broad spectrum vitamins and essential nutrients to help fight parasites. · Hormonal Changes - female dogs with advanced age undergo hormonal changes which are known to cause thinning of the coat. These hormonal changes are especially severe in female dogs who have recently given birth and have completed nursing their litter. HardyPet Skin/Coat aids in balancing hormone levels and lessening the severity of hair loss which is seasonal or caused by advanced age or breeding. · Other Medical Conditions - There are many medical conditions which are known to cause unexplained hair loss. Proper veterinary care is always the first step to identifying the cause of any unusual hair loss. Most veterinarians recommend HardyPet Skin/Coat as a part of their treatment program for hair loss which results from a medical condition. During an episode of a skin condition, hair loss, or hot spots HardyPet Skin/Coat dosages may be doubled for up to three weeks. Q: I am trying to determine frequency that I need for skin/coat supplement for auto ship. The dog is a large golden. Also do you have anything for cats? Q: What is the dosage of the Hardy Pet Skin&Coat? One a day? or is it tied to dogs weight? A: Recommended dosage is based on weight. Dogs under 25 lbs should have 1/2 of a wafer per day. Dogs between 25 and 100 lbs should receive 1 wafer a day. And dogs over 100 lbs should receive 2 wafers per day. Q: My dog is on home cooked grain free diet. Does this product have sufficient calcium, or would additional calcium need to be added to her diet?